You are here: Home / Tips / How to Add Additional WordPress Menu in thesis? How to have a menu that is not a thesis menu but an additional Wordpress menu which means it is not hard coded links in your thesis theme? When re-designing my Technical Analysis Blog to Thesis Theme I wanted to have a menu that is not a thesis menu but an extra WordPress menu. Searching Google I landed on few articles but they all referred to static links hard coded into the theme and not have an WordPress Menu integrated. So I thought I will share my code of having an additional WordPress menu in your thesis theme. The process is pretty simple and all you have to do is add few lines to your custom_functions.php file. 2. Hook to display the menu at an appropriate location. I wanted an additional menu in header and so the code becomes. You can replace thesis_hook_header with your location of thesis hook. 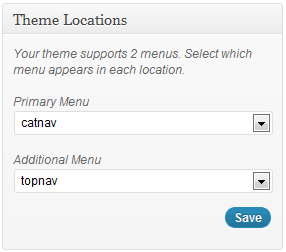 Visit menu option in your WordPress admin and now your Thesis theme supports an additional menu. I hope it helps other fellow thesis developers. Share your feedback in comments below.